I stopped by The Party Source for a conversation with Quaff Bros co-founder Danny Gold and Quaff collaborators Scott LaFollette, head brewer at Blank Slate Brewing Company, and Jason Brewer, from Listermann’s/Triple Digit, about wandering breweries. That discussion evolved into a full history of Quaff Bros which you can learn about below. It seems these days that almost every brewery has a barrel aged beer of some variety of another. Back in 2009 that wasn’t the case. Sure barrel aged beers were popular but not as common as they are now. It was in this environment that two guys at The Party Source had the idea to fill spare barrels with local beer. According to Danny Gold, Craft & Specialty Beer Buyer at Party Source and co-founder of Quaff Bros, and Jay Erisman, fine spirits manager at The Party Source and other Quaff co-founder, realized they had spare barrels and nothing to do with them. When Jay buys a private label whiskey the barrel is included in the purchase. With a recent tax hike in Kentucky on alcohol, they were looking for new revenue streams for the store and thought of turning those barrels into a specialty beer label. For breweries to do a barrel aged beer the hardest thing for them to get is the barrel. It’s unique to Quaff that they’ve got the barrels but don’t know what to do with them. It allows you to be more creative with them. If I had a barrel, I’d be coveting the fact that I had a barrel and wouldn’t do as exciting things. It opens all of us up to do different things with barrels that we wouldn’t do on our own. The concerns Scott voiced above is exactly what’s unique to Quaff Bros, they bring the barrel to the brewery. Danny and Jay brought the barrel up to Mt. Carmel who brewed a beer to fill the barrel and a few months later Jones IPA, and “The Brotherhood of the Quaff,” was born. After a few rounds of this Mt. Carmel had grown and couldn’t take on the Quaff projects anymore. Danny & Jay then invited a new brewery in the area, Rivertown, to become a Quaff Brother. This process has repeated for the past five years with new breweries being added into the brotherhood as they’ve opened. A beer cellar with a Quaff collection is a happy cellar! This process of brewing beer at different breweries is gypsy brewing. Personally, I’m not a fan of that term as it is a derogative term commonly associated with the Roma people. Instead, I like to think of Quaff Bros as a wandering brewery. Danny wanders around to the local breweries with a barrel and the brewery either makes a batch for Danny. Almost every brewery in Cincinnati is in the brotherhood now or will be soon. Rhinegeist, MadTree, Cellar Dweller, and 50 West all have beers in Quaff barrels coming out this year to make them Quaff Bros. 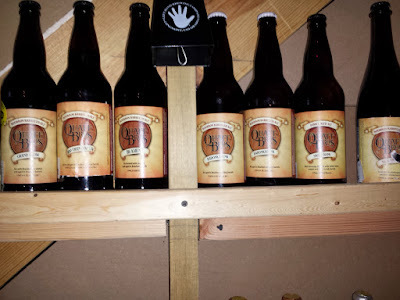 Most of the Quaff Bros. beers are bottled and those bottles are sold only at The Party Source. An awesome thing about the barrel aging aspect of Quaff beers is that almost all of them are excellent for extended aging in your cellar. The Brettanomyces yeast in Bodunkafunk is great now and will likely be awesome later. Both Sour Grapes and Savage Blank improve every time I try them. Sadly, most Quaff beers are one offs and once they’re gone they’re gone for good. Bodunkafunk and the latest beer Quaffinator (a pepper doppelbock made at Blank Slate) are still available for sale and I’d advise trying them out when you can. The latest beer is now Amberdextrous, a bourbon whiskey barreled amber ale brewed by Rivertown and is also Quaff Bro’s first ever 6-pack. 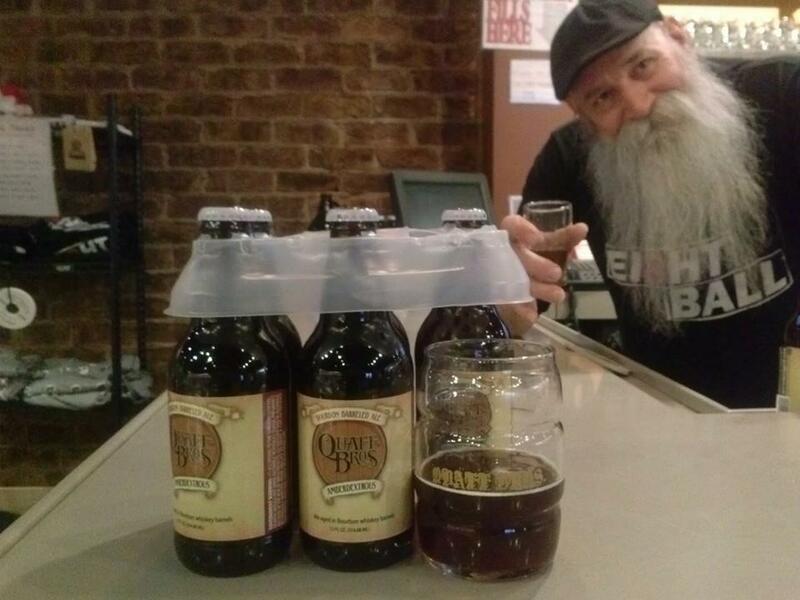 The beautifully bearded Peanut and the Quaff Bros newest beer, and first ever 6-pack, Amberdextrious! Like Quaff Bros on Facebook to get notified of any future beer releases, 11 will be coming out this year! Worst beer brand name ever? I wouldn’t say worst as I’m guessing there are some really bad ones out there somewhere. Also, not going to say best but what really makes this one worse than so many others? Previous Previous post: The Return of My Favorite Local Beer: Rivertown Death! Next Next post: Will Poor Quality Burst the Craft Beer Bubble?